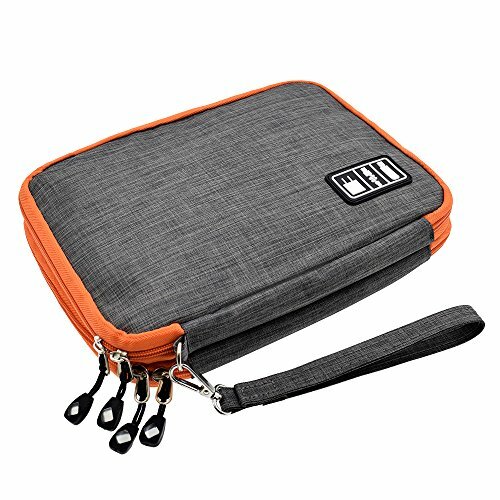 It with bright color and more space but only takes up small space, and will be so easy to spot wherever you are: bedroom/hotel, inside your backpack/luggage, in the car. ■With the difference in the measurement method, please allow 1-3cm in size deviation. ■Due to take in light and the monitor, the actual color of the backpack may have a slight difference. 【HIGH QUALITY】Made of heavy-duty, durable and waterproof nylon and comes with handle. We upgraded this item, the stitching is done more nicely which is the cords fit more well. 【UNIQUE DESIGN】Stronger zipper and more space. Double layer nylon interior compartment, and zippers closure ensure your item secure. 【MULTI-FUNCTION】Except for storage of electronic accessories, such as various USB, data cable, power bank, you can also put it as a cosmetic bag and baby healthcare kit or anything you want to store. 【LARGE SIZE AND PERFECT APPEARANCE】Double layer electronics accessories bag size - 11.4" x 7.87" (L x W). fits for iPad, iPad Mini(7.9-inch), iPad Air(9.7-inch). The combination of grey and orange looks interesting. 【EASY TO CARRY】The carrying bag takes up a small size, you can put or hang it in a backpack, suitcase, handbag, etc.... No matter when and where it will provide you with convenience. If you have any questions about this product by LIFEMATE, contact us by completing and submitting the form below. If you are looking for a specif part number, please include it with your message.